WE HAVE A FORM FOR THAT By JOHN W CAMPBELL JR ASTOUNDING has about seven formletters, and UNKNOWN about five more, using some of those that fit ASTOUNDING in common with it. Authors don't like form letters; don't; perhaps, quite understand the meaning of those form-letters. A number of fans have gotten them, and, perhaps, felt that littke attention or personal criticism had been given their stories. Now generally speaking, magazines don't do things without some sound reason. One obvious reason for form letters --- and the reason authors hasten to impute --- is that we're kept rather busy hers at the office. That represents about 10% of the reason for form letters --- because the business that keeps us busy is finding and developing authors, naturally. I spend something like 75% of my time on that one job. It doesn't take a lot of time or effort to handle the work of old, established writers. They already know the techniques of writing, the values and emphasis needed. It's the new man who needs time and coaching. The main reason for form lettors lies in the faults of the authors. There are two forms that are basic; straight bounce for a writer who has not yet developed character enough in his work to make it possible to single out his faults in any reasonably short letter, or for the writer who just, plain, can't write anyway. The next advanced stage gets a rejection form letter --- impersonally morded, but personally signed. That goes out to fairly capable handling of material that simply isn't suitable to the magazine, and to encourage a man who's showing signs of ability, but who hasn't yet developed character enough, in style or handling, to make a pointed criticism worth-while to him, or to me. Then, the next higher grade is general --- subdivided into a wide class of specific faults. Now if you bring an automobile into a garage to find out what's the matter the expert listens to the engine a moment, let's say, grunts, and reports "Burned out rod bearing". There isn't, really, much back-yard mechanic, he can take it home and fix it. With a story, if there isn't enough of an idea to hang the action on --- with the writing ability the author has displayed --- what more can I tell him than that the idea isn't strong enough? Now it's true that an idea too weak for a stroy in the hands of one man can make a powerful, moving story in the hands of another, but that doesn't help a given author much. 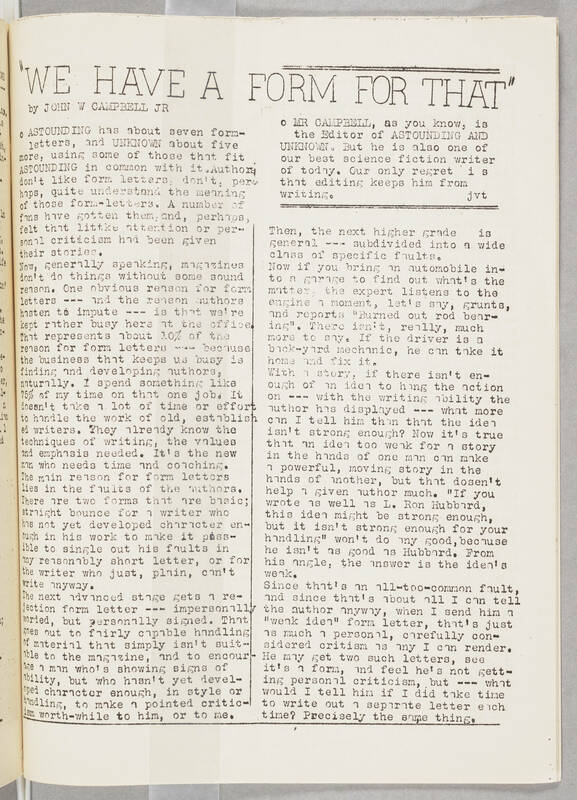 "If yoy wrote as well as L. Ron Hubbard, this idea might be strong enough, but it isn't strong enough for your handling" won't do any good, because he isn't as good as Hubbard. From his angle, the answer is the idea's weak. Since that's an all-too-common fault, and since that's about all I can tell the author anyway, when I send him a "weak idea" form letter, that's just as much a personal, carefully considered critism as any I can render. He may get two such letters, see it's a form, and feel he's not getting personal criticism, but --- what would I tell him if I did take time to write out a separate letter each time? Precisely the same thing.